Activation of HIFs by hypoxia and inflammation. (A) HIF-α subunits are regulated by posttranslational hydroxylation of two specific proline residues by PHD enzymes in normoxic conditions. This leads to VHL-mediated proteasomal degradation. As O2 concentration drops or mitochondrial ROS production increases HIF-α subunits are stabilized, dimerize with ARNT, and translocate to the nucleus and bind to HRE sequences in target genes. 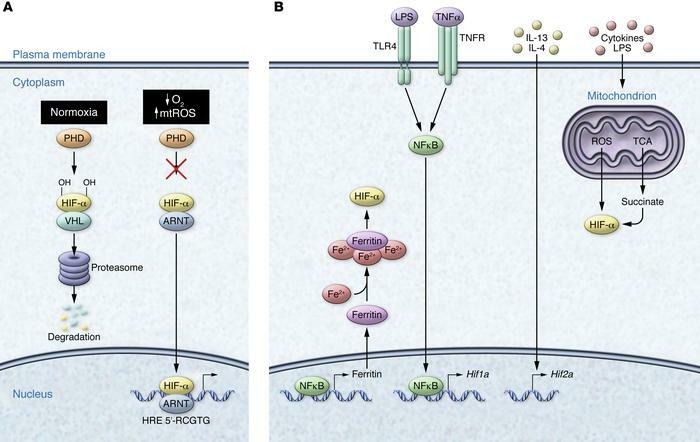 (B) HIFs are activated by inflammation through cytokine-induced Hif2α expression, NF-κB–mediated transcription of Hif1α, NF-κB–dependent ferritin iron sequestration, cytokine-mediated mitochondrial ROS production, and the TCA metabolite succinate.